Morgan Family Pet Services, a family owned and operated small business, this week announced it has added a new location in downtown Frederick, Maryland. Susie Morgan, co-owner of the Frederick location, has been pet sitting independently since 2011. When she met her now-husband Marc, the couple discovered this was one of many common interests; Marc and his parents had founded Morgan Family Pet Services in Ellicott City, Maryland, in 2011. In 2016, Susie created an extension of the family business to continue serving current and new clients in the downtown Frederick area. Susie is thrilled to meet new owners and their pets, and says this full time job is rewarding. "Spending time with furry creatures, walking them in beautiful downtown Frederick – what's not to love? At Morgan Family Pet Services, our goal is to provide pet owners the experience of having a friend who will be there to care for their pets, rather than just a service." Susie and Marc agree that running a family owned and operated company offers a great benefit to their clients. All pet care is done solely by the Morgans, meaning no external employees or contractors, which fosters trust between the company and its clients. The Morgans conduct initial consultations before taking on a new client to ensure that the pet owners, and the pets themselves, are comfortable and confident in the care that will be provided. 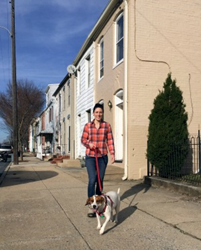 Morgan Family Pet Services provides downtown Frederick pet owners with walks and pet sitting in their home. The company provides services for cats, dogs, and other small pets. The owners of the Frederick location have a combined eight years of experience and are insured.